Both U.S. Republican presidential candidate John McCain and his running mate Sarah Palin have called for the resignation of fellow Republican Ted Stevens, a day after a federal court convicted the Alaskan senator on seven felony charges. 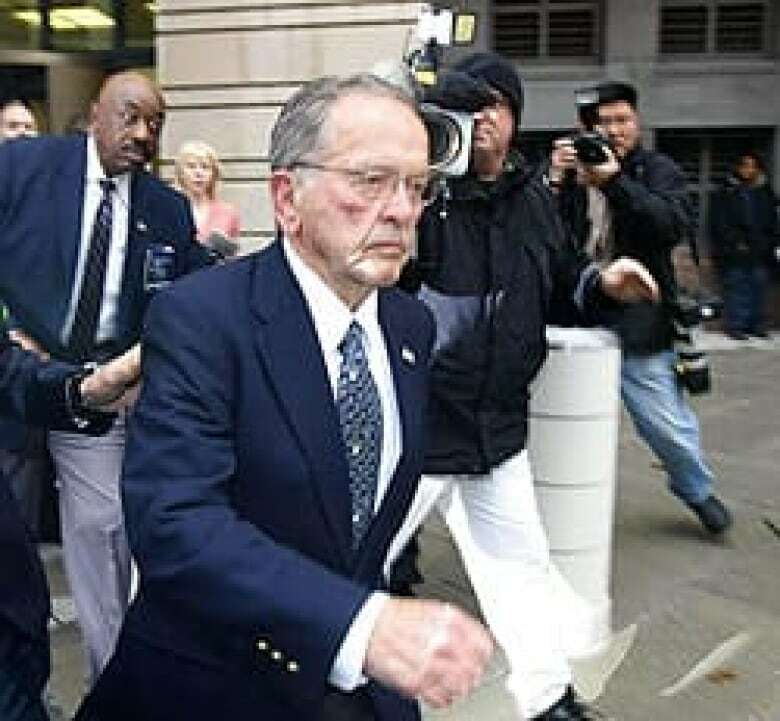 Senator Ted Stevens leaves federal court in Washington, D.C., on Monday after being convicted of making false statements on U.S. Senate financial documents. ((Gerald Herbert/Associated Press))Both U.S. Republican presidential candidate John McCain and his running mate Sarah Palin have called for the resignation of fellow Republican Ted Stevens, a day after a federal court convicted the Alaskan senator on seven felony charges. "It is clear that Senator Stevens has broken his trust with the people and that he should now step down," McCain said in a statement issued Tuesday morning by his campaign. "I hope that my colleagues in the Senate will be spurred by these events to redouble their efforts to end this kind of corruption once and for all." The convictions are "a sign of the health of our democracy that the people continue to hold their representatives to account for improper or illegal conduct, but this verdict is also a sign of the corruption and insider-dealing that has become so pervasive in our nation's capital," McCain said in the statement. In an interview Tuesday with CNBC, Palin said her fellow Alaskan Stevens should step aside now and allow the state to elect someone else. Stevens, 84, the U.S. Senate's longest-serving Republican, is up for re-election and faces Alaska's voters next Tuesday as a convicted felon. Stevens could be sentenced to as many as 35 years in prison, although he is likely to receive far less, if any, prison time. If re-elected, he could face an expulsion vote in the Senate, although senators can recommend a lesser sanction. Stevens, who entered the Senate in 1968, was found guilty of making false statements on Senate financial documents. The charges stemmed from claims that he received free home renovations and other gifts worth more than $250,000 US from his friend and millionaire oil contractor, VECO Corp. chief executive Bill Allen. Stevens has made no indication yet that he intends to step down as a result of his trial and subsequent conviction. "I am innocent. This verdict is the result of the unconscionable manner in which the Justice Department lawyers conducted this trial," Stevens said in a statement issued after a jury at the courthouse in Washington, D.C., gave their verdicts on Monday. "I ask that Alaskans and my Senate colleagues stand with me as I pursue my rights. I remain a candidate for the United States Senate." McCain and Stevens have clashed repeatedly over so-called earmarks, provisions attached by lawmakers to bills that typically seek to boost funding for pet projects. McCain has long railed against earmarks, particularly in the presidential campaign, singling them out as a source of political corruption. Stevens, on the other hand, boasts a proud record of securing earmarked funds for Alaska. Democratic presidential candidate Barack Obama also said Tuesday Stevens should resign. "Yesterday's ruling wasn't just a verdict on Senator Stevens but on the broken politics that has infected Washington for decades," said Obama. "It's time to put an end to the corruption and influence-peddling, restore openness and accountability, and finally put government back in the hands of the people it serves. Senator Stevens should step down." The Alaskan Democratic party also called for Stevens to resign immediately in a statement issued Monday. "He knew what he was doing was wrong," the party said in the statement. "But he did it anyway and lied to Alaskans about it." Nevada Senator John Ensign, chairman of the National Republican Senatorial Committee, virtually conceded the Alaska race in the wake of the guilty verdict. "Ted Stevens served his constituents for over 40 years, and I am disappointed to see his career end in disgrace," Ensign said. "Senator Stevens had his day in court, and the jury found he violated the public's trust — as a result he is properly being held accountable. This is a reminder that no one is above the law." But Representative Don Young, a veteran Alaskan Republican who faces a tough fight in the House of Representatives election amid questions about his own ethics, said he still thinks Stevens can win. "He's the best thing for the Senate. Alaskans know this: this is a trumped-up charge," Young said. Stevens's conviction, which is looking increasingly damning for his political future, appears to give the Democrats a boost in their unlikely bid to capture a filibuster-proof majority in Senate elections on Nov. 4. Stevens is in a close race with the Democratic mayor of Anchorage, Mark Begich. "Well, I think the Democrats are looking lovingly, I may say, at his seat in Alaska," said the CBC's Henry Champ, who is covering the U.S. election campaign in Washington, D.C.
"It is almost certain, say people in Alaska, that these convictions are going to mean that Stevens, who is the longest-sitting Republican senator in history, will lose that election," Champ said on Tuesday. Thirty-five of the Senate's 100 seats will be contested in next week's election. The vote coincides with the House of Representatives and presidential elections, as well as some state gubernatorial races. Currently, Democrats and Republicans each hold 49 seats in the Senate, and there are two independents, Bernie Sanders of Vermont and Joe Lieberman of Connecticut. Both normally vote with the Democrats, giving the party a slim majority. The Democrats are looking not only to retain their 12 Senate seats in next Tuesday's vote, but also take some of the 23 seats the Republicans are defending. Of the states up for grabs, four — Virginia, New Mexico, Colorado, and Alaska — are leaning Democratic, said Champ. Democrats will have to hope for wins in several close races in Oregon, Kentucky, Minnesota, North Carolina and New Hampshire, in order to win the 60-seat majority, said Champ. "I think that is probably wishful thinking, but the closer they get to 60, the more certain they feel about moving their agenda forward." Among the issues most pressing to Democrats are health care and economic policies that they feel were held up by the Bush administration, said Champ. "They're hoping with [an Obama win] they will be able to move more quickly forward with this."